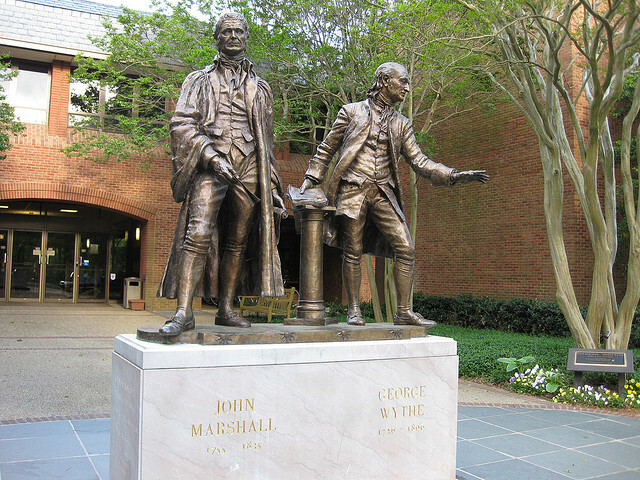 I was honored to be a participant in a a symposium yesterday in Williamsburg at William and Mary’s Marshall-Wythe School of Law. The event was the annual symposium of the school’s Election Law Society, which is led by Professor Rebecca Green and filled with a seemingly endless supply of enthusiastic and capable students. + John Fortier of the Bipartisan Policy Coalition, who delved into his considerable academic and professional experience to lead a discussion on voting flexibility. Later in the day, the School convened a larger discussion in the school’s courtroom at which the end results of the morning discussions were presented by the student leaders. That session also featured remarks by a pair of well-regarded Washington attorneys, Cleta Mitchell of Foley&Lardner and Perkins Coie’s Bob Bauer (one of the two co-chairs of the forthcoming Presidential Commission on Election Administration). Those remarks were extremely interesting: Mitchell took the opportunity to question whether the intense focus on long lines post 2012 was actually justified by the evidence and whether it was likely to result in a drive for a pre-determined set of policy changes including expanded – or as she called it, “mandatory” – voter registration. She also called for a greater investment in technology to address all of the challenges facing elections today. Gessler, despite his experience as a lawyer, observed that most of the current problems facing elections are not legal but management problems. He illustrated the point by a hypothetical scenario where a lawyer leaves practice to open a coffeeshop – noting that long lines there would be a problem because of the cost to the business, but that such problems wouldn’t be solved by “opening a law book or hiring one or more lawyers.” He called for a greater management focus – including collecting and using cost data to help election officials and policymakers alike conduct cost/benefit analyses of potential changes. Herrnson noted the increasingly difficult environment for developing and deploying voting technology, both because of the lack of resources in election offices as well as the shifting and uncertain nature of current certification and testing regimes. He agreed with Mitchell about the need for better technology but cautioned that even the threat of litigation can slow or limit new technology, as it did with Maryland’s online absentee ballot delivery system in 2012. Fortier echoed Bauer’s interest in reaching out the business community and talked about the concept of “big box voting”, which looks at ways to scale up in-person voting (both on and before Election Day) with the aim of increasing efficiency while keeping an eye on convenience for the voter. Obviously, the private sector has thought a lot about the ways to make large-scale customer-focused operations work and he thought we can find ways to tap that expertise. All in all, it was a great event and yet another showcase for the excellent work of the Election Law Society at William and Mary. Thanks to them for the invitation to participate! 1 Comment on "Election Law Symposium at William and Mary"
Most of you have never had the pleasure of meeting Rebecca Green, but once you get the chance, your “gut instincts” will kick in and you will see that this is someone who is devoted to her audience and has boundless energy trying to improve our mutual understanding and make the world a better place.